Christian Odjakjian also contributed to this article. 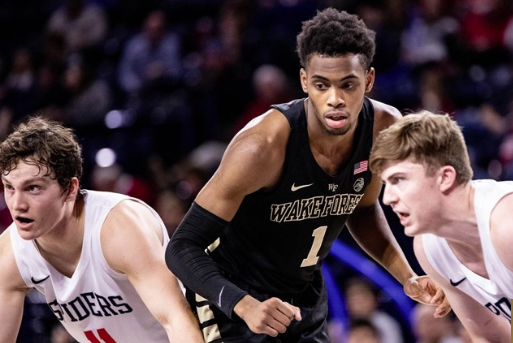 The Wake Forest Men’s Basketball team came up short in their first true road game of the season, falling 84-74 to the University of Richmond. No road game is a sure thing, but the 10-point loss was quite a disappointment against a Richmond team that entered the game with a 2-5 record. This includes losses to the unimpressive Longwood Lancers and Hampton Pirates. Turnovers were the main area of concern for the Deacons, coughing the ball up 15 times compared to only three for the Spiders. Richmond capitalized with 28 points off turnovers, while Wake tallied a measly two. The turnover situation was a glaring issue, but there were definitely bright spots. The Deacons shot the ball well from the field, shooting 47 percent from inside the arc and 36 percent from downtown. Junior guard Brandon Childress and freshman forward Isaiah Mucius led the way with 17 apiece, with sophomore guard Chaundee Brown right behind them with 16 of his own. The Deacons will look to get back on track against the Charlotte 49ers (2-4) at home on Thursday, Dec. 6. After 11 days of rest, Wake will face their two toughest non-conference opponents in a span of five days. A dangerous Davidson team comes to Winston-Salem on Dec. 17, and on Dec. 22 the Demon Deacons travel to Knoxville Tennessee to play the No. 7 Volunteers. The second semester of the school year begins on Jan. 14, and Wake Forest has five more games following the Tennessee one. The non-conference slate will be rounded out when the Deacons host Gardner-Webb and Cornell on Dec. 29 and Jan. 2, respectively. ACC play gets underway on the 5th day of the new year with a road matchup against Georgia Tech. Three days later a dominant Duke team will come to Winston-Salem, and the Deacons will look for their first win against the Blue Devils since 2014. And finally, on Dec. 12, the team will travel to Miami to play the Hurricanes. A 4-3 start isn’t ideal, but there is still a lot of basketball to be played. The next month of action will provide the Deacons with several chances for quality wins to get the season back on track.